●B.A., Human Relations, Keio University, Tokyo, 1995. ●M.A., Children's Literature, Shirayuri College, Tokyo, 1997. ●Ph.D in Literature, Shirayuri College, Tokyo, 2016. ●Researcher, Shirayuri College Research Center for Children's Culture, Tokyo, 2000-Present. ●Researcher, Comprehensive Culture Research Center, Aoyama Gakuin Women's Junior College, Tokyo, 2014-2016. ●Associate Professor, Hakuoh University, Tochigi. April, 2014-present. ●Associate Professor, Tokyo Jogakkan College, Tokyo. June, 2013-March, 2014. ●Adjunct Instructor, English, Kokugakuin University, Kanagawa. April, 2013-March, 2014. ●Adjunct Instructor, English Literature, Kyoritsu Women's University, Tokyo. April, 2013-2015. ●Assistant Professor, Tokyo Jogakkan College, Tokyo. April, 2009-May, 2013. ●Adjunct Instructor, English, Tsuda College, Tokyo. April,2008- March, 2009. ●Adjunct Instructor, English, Chiba University of Commerce, Chiba. April, 2008-March, 2009. ●Adjunct Instructor, English, Aoyama Gakuin University, Kanagawa. April, 2007-March, 2009. ●Adjunct Instructor, English, Tokyo University of Marine Science and Technology, Tokyo. April, 2007-March, 2008. ●Adjunct Instructor, English, Kanto Gakuin University, Kanagawa. April, 2006-March, 2009. ●Adjunct Instructor, English Children's Literature, Shirayuri College, Tokyo. April, 2000-March, 2004. 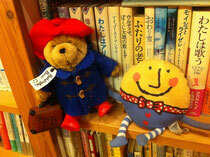 My fields of interests are books / picturebooks for children in English-speaking countries and in Japan. In particuar, I have been researching on books for/about American ethnic minorities.